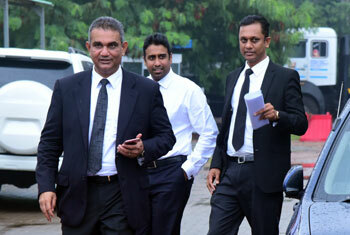 Gamini Marapana PC, the lawyer representing Arjun Aloysius said today that he has advised his client not to testify before the Bond Commission. Raising objections to the summoning of Aloysius, Marapana said that his client would be “self incriminating himself,” if he took the stand. Marapana is the brother of current Foreign Minister Thilak Marapana who was forced to resign earlier following his conflict of interest with regard to the Avant Garde case. Marapana is a close associate of Ranil Wickremesinghe and the cabal which perpetrated the scam. Citing cases and the Presidential Commission Act, Marapana said that it was an established norm in Criminal Law that no accused will give witness against himself. He further said that an accused does not need to provide documents which would incriminate himself, referring to the phone and laptops taken out of Aloysius’ possession. However, Acting Solicitor General Dappula De Livera in response said that the Commission was one set to find fact and that no witness is an “accused”. He said that no person has been incriminated and as such criminal law principles do not apply in the Commissions proceedings. Referring to the mandate and the warrant from which the Commission derives legality, De Livera said that it was clear that the Commission was not created to investigate persons – but an incident. He said that the “wrongdoers must be identified”. He further said that the Act is very clear on the powers and functions of the Commission and as such Aloysius must be called to “ascertain the truth”. He said both Arjun Aloysius and Arjuna Mahendran must be called to tell the country about the “robbery“. De Livera taking a visible swipe at the fees the lawyers must be paid, twice said that Marapana “has justified his presence, although what he said has no relevance”. De Livera said the “country wants both of them on the stand. This is matter of national importance and he must take the stand”. The Commission said it will deliver an order on Wednesday. Marapana said that in the event the order was given against him, Aloysius should be given time to appeal. Aloysius was served summons to appear before the Commission to testify on Wednesday.